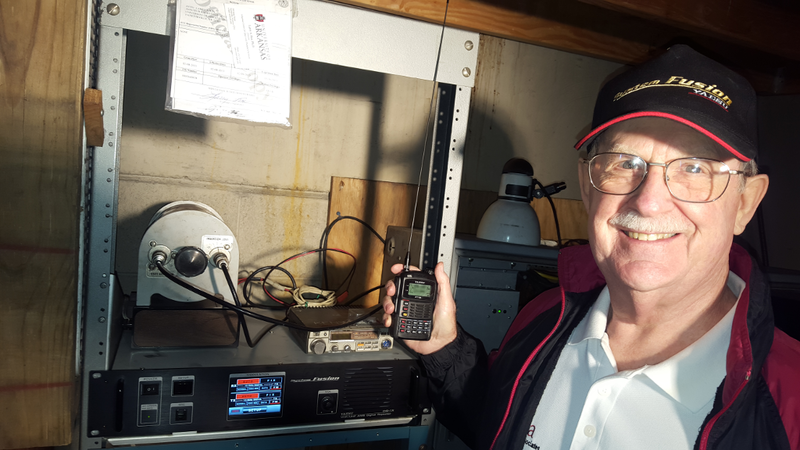 Murray, W5XH, poses with the new W5YM Yaesu DR-1X repeater system, installed in January 2016. ARCUA is proud to announce that our new Yaesu DR-1X Fusion repeater is now installed and in-service on the University of Arkansas campus. This unit replaces the older ICOM unit that has been in operation for many years and deserves retirement to backup status. The new repeater had been undergoing evaluation for some time in the W5YM Shack to (hopefully) assure that everything is stable. 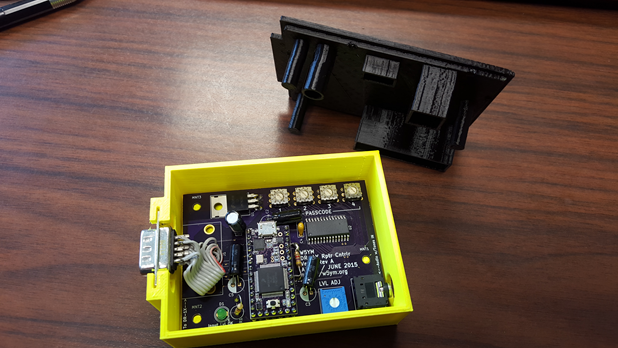 During that time, a custom controller was designed by Mike, AE5ZC, to allow remote control of the repeater system. 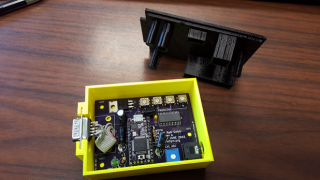 The W5YM repeater controller, based on a Teensy3.1 USB-based microcontroller development system, enables remote control of the W5YM DR-1X repeater system. The new W5YM repeater is operating in “Auto/Auto” mode, which means that if the incoming signal is a Yaesu Fusion digital mode, it will be repeated using the same digital mode. Likewise, analog FM signals will be repeated as analog FM. Thus, users with “classic” analog FM equipment can still use the repeater with no issues. Users with Yaesu Fusion equipment, such as the FTM-400DR, FT-1D, FT-2DR, or FT-100DR can operate their radios in “AMS” mode, which will automatically select the received signal mode and transmit to match the same mode. 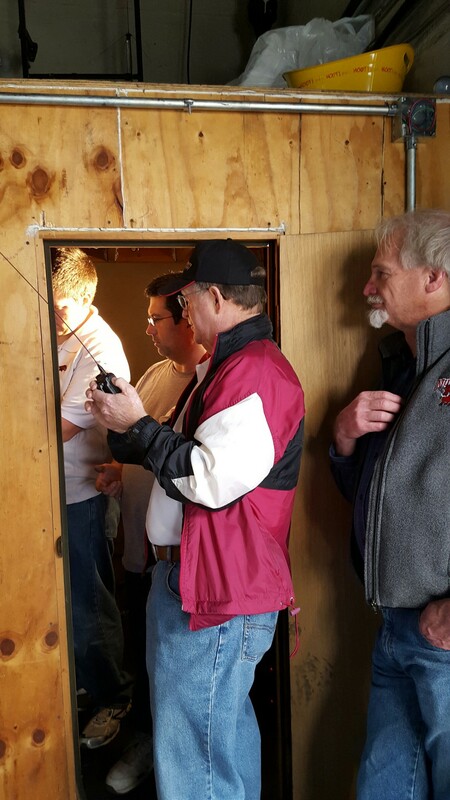 Installation crew for the W5YM repeater in January 2016. 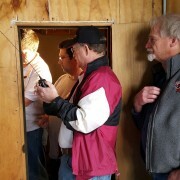 (From L-R) Matt, W5VO; Michael, AE5ZC; Murray, W5XH; and Larry, WJ5V. Picture taken by Dan, K5FXB. Unlike the old repeater, the new repeater is configured to both receive and transmit a CTCSS tone of 110.9 Hz. In addition to transmitting the CTCSS tone, analog FM users should configure their receiver for decoding a 110.9 tone (if it is capable of doing so) to avoid hearing the digital “squawks” when digital users are using the repeater. Recently, Murray (W5XH), Dan (K5FXB), and Mike (AE5ZC) took a drive around Fayetteville and recorded data regarding repeater coverage. By using that data and correlating it with data generated with the excellent online tool at the Radio Mobile web site, the coverage of the W5YM repeater was plotted; a lower resolution of that plot is shown on this page. If you would like to download a hi-resolution of the data and overlay it in Google Earth, download the following file: W5YM Repeater Pattern HiRes Jan2016 RevA. Estimated W5YM repeater pattern as of January 2016. ARCUA encourages all users of the W5YM repeater to try out the new system and report any problems. More information on Yaesu’s digital radio products can be found on the Yaesu website. All models allow for operation using the new digital voice modes, analog FM, and APRS. ARCUA wishes to thank Murray Harris, W5XH, for his gracious support that allowed the new repeater to be purchased and installed. Hope to talk with you on the new repeater sometime soon!